I've been invited to moderate the closing panel at this year's Asset Management Forum on To beat or not to beat - The active vs passive investing debate on 1 September in Zürich. It would be great to see you at that event. You can register following the link above. The next date to save is a little bit further out: 9 March 2011. This is the date of the Swiss Pensions Conference, the preparation of which I am heavily involved with. You can watch the progress of those preparations under that link. This copy of Sigma has been sitting around for way too without being mentioned here: The role of indices in transferring insurance risks to the capital markets. It's such a comprehensive overview of insurance linked securities (ILS) that I wanted to do an in-depth review, but never got round to it. Given that this market segment links two very relevant marketplaces (capital markets and reinsurance), its growth from 4% of catastrophe reinsurance capacity 5 years ago to 12% of capacity now is substantive. However, Sigma does not answer the #1 question that concerns me as an investor: how do I know whether the premium I get for taking the risk in question is fair, assuming that the issuer will only approach the ILS market if he thinks that he can get a better deal there than in the conventional reinsurance market? How is the reinsurance market in any specific segment priced? There seems to be a significant amount of information asymmetry there. Pension fund longevity risk is becoming increasingly important. Longevity indices would allow the creation of liquid derivatives that could be used to hedge this risk. However, there are a number of criteria that such indices would need to fulfil to provide an optimal solution, as well as a number of forms that the derivatives could take. These features are discussed, together with the characteristics of some existing longevity indices. Longevity indices look like a viable risk management instrument, but given their utility bounded by liquidity and granularity, they are anything but trivial to design. Add to the mix an extremely fragmented market like the Swiss with its many small IORPs and their high volatility risk. Longevity risk also comprises level risk, trend risk and catastrophe risk. Interestingly, catastrophe risk is only seen as a one-off surge in mortality rates: "similar one-off falls in mortality rates do not occur." Black swans, anyone? Fernando Restoy, Chairman of CESR-FIN, has given a remarkably candid speech about convergence, governance and - most notably - the link between accounting and other regulation to the eponymous recent IFRS conference. It is certainly going too far to list him as a supporter of our recent hypothesis, but his closing reference to the "somewhat excessive scope of the standards" certainly points in the same direction, especially when read in conjunction with Sir David's idea of a regulatory income account, which is probably little else than a reconciliation item between RAAP and IFRS. 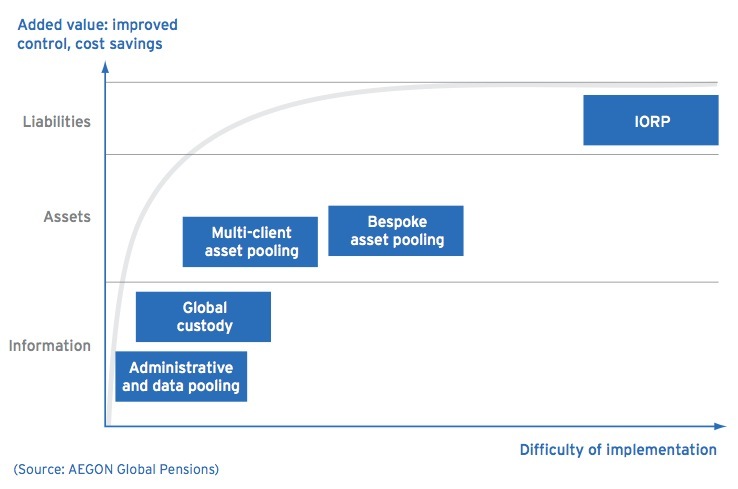 This nice illustration of the consolidation continuum that stretches from informational to comprehensively organisational is taken from the Aegon white paper on asset pooling. The paper is as good an overview of the issues involved as white papers go.